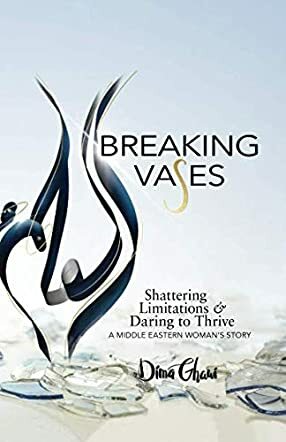 Breaking Vases: Shattering Limitations & Daring to Thrive is a self-help book which tells the story of its author, Dima Ghawi, and many other women around the world who have and are suffering from a backward society which treats women as second rate citizens in a male-dominated world ruled by culture, and a culture ruled by religion. Ghawi goes into depth about her upbringing and her outlook on life as a young girl growing up in a country where it is not uncommon for women to not have a proper education. The title of this book comes from a story which Ghawi’s grandmother told her when she was a child. Glass vases represent women and if it were to shatter or crack, the vase would never be the same, people would be able to see the flaws, and if people saw these bad things about a woman then that woman would bring shame and dishonor to herself and to her family. One of my favorite things about this novel is how Ghawi not only shows how society can shape the ideal image of a woman, it can also mold the way a man must think of himself. I expected to read only a few chapters when I opened Breaking Vases, but Ghawi’s skills as a storyteller captivated me. I couldn’t stop reading; her memoir is thought-provoking and its contents are still relevant in today’s society. Breaking Vases: Shattering Limitations & Daring to Thrive talks about love, honor, and courage. It teaches you to love yourself, to honor yourself, and to be brave when the rest of the world is telling you not to. I had no idea what an amazing read I was embarking on when I got my copy of Breaking Vases. The author takes you on a journey through her experiences as a Middle Eastern woman and her journey to empowerment, strength and courage. - We all have limitations that we face in our lives; we can think of them as obstacles that are insurmountable but instead should view them as welcomed challenges to overcome and work through. Every problem has a solution. It's up to you to use your ingenuity, bravery, and creativity to find a solution. - We may or may not understand why we experience the things that we do in our lives, but everything happens for a reason. We may not know the reason at the time. We may never know the reason. But there is a reason nonetheless. - All the people who come in to our lives (the kind or cruel, the authentic or self-serving, the noble philanthropists or tyrants) serve a purpose in our lives and through knowing them, we learn about ourselves and and continually grow as individuals. Feel the fear that you face in your life. Embrace it. And then? Turn your fears and the pain they cause you into the power and perseverance you need to fuel your journey of growth and self-discovery. You hold the keys to your future. Read this book and embrace the inspiration it contains. It's beyond worth the read. It's a game changer if you really "hear" the message that it contains.